For new potatoes, Jersey Royals are actually pretty old. They’ve been cultivated on the beautiful island of Jersey for over 130 years and were given PDO status back in 1996 – making them the only potato in the UK deemed special enough to gain EU protection. Along with other seasonal ingredients like asparagus and broad beans, they’re one of the real treasures of spring and early summer, making their way into homes, restaurants and eventually our mouths from late March to July. After that they’re all gone, and we all have to wait another year to taste these creamy, flavourful potatoes again. It’s easy to forget about the hard work that goes into farming when it’s so easy to buy clean, ready to cook produce in shops. But without Jersey’s potato farmers, who spend the majority of the year tending to this one single crop planted across 7,300 acres of the island, we’d never get to taste Jersey Royals. It’s not just a case of throwing a few sprouted spuds into the ground before reaping the rewards months later, either – there’s a lot of hard work that goes into getting these potatoes to taste so good. Our photo story of the Jersey Royals harvest is an homage to the farmers who work tirelessly on the island to bring us this very special ingredient each year. Taking photos using a drone and getting up close to the produce on the ground gives you a real sense of the island, its people and its potatoes. Jersey gives up around half of its total land to farming, and agriculture is a vital part of the local economy. Around 30,000 to 40,000 tonnes of Jersey Royals are grown annually, many of which are exported to mainland UK – the only other place the potatoes are available. Harvesting begins at the end of March and lasts until July, with growers working round-the-clock to make sure the produce is packed up and shipped off as quickly as possible to ensure freshness. Surprisingly, many Jersey Royals are harvested by hand, as the fields they’re grown in are too steep for machinery to work on. The pickers work in twelve-hour shifts, taking up to 1,500 tonnes of potatoes out of the ground during peak production in May. Towards the end of the season potatoes on the flatter fields can be harvested by mechanical means, but these tend to be inland rather than by the coast. Once all the potatoes are picked, checked over twice to ensure quality, packed into refrigerated trailers and distributed across Jersey and the UK, the fields are left empty for a few months (or longer) until it’s time to get ready for the next harvest. That doesn’t happen until at least November, when sprouted Jersey Royals are planted under sheets of glass to protect them from frost and cold weather. However, it’s from January through to April that the majority of the seed potatoes find their way back into Jersey’s rich, fertile soil. There are only around twenty farmers responsible for the world’s supply of Jersey Royals and they like to do things traditionally – for example, many of them use a local seaweed known as Vraic as a natural fertiliser. 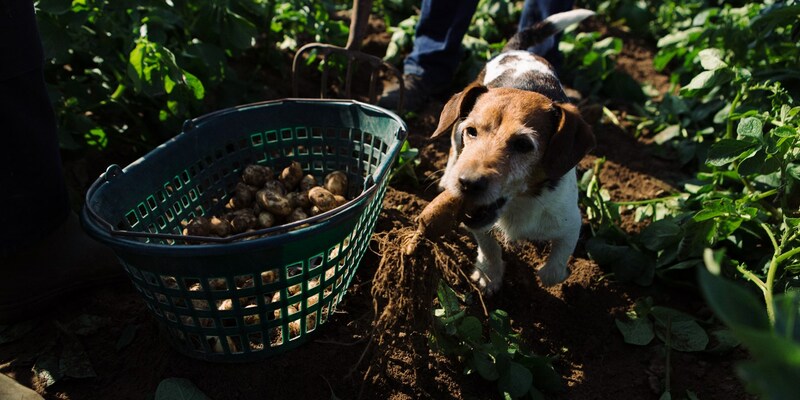 So while we’re eagerly waiting for the crop to come back into season and Jersey Royals to appear on our supermarket shelves once again, this handful of farmers are tending to their crops on a daily basis, making sure their potatoes are just as special as the previous year’s harvest. And they haven't had a bad year yet.